Comedian, writer, and television producer, born in Philadelphia, Pennsylvania, USA. Rather than repeat the tenth grade, he left school and joined the navy. While attending Temple University on an athletic scholarship, he appeared at New York's Gaslight Cafe (1962), where his comic routines were so successful that he left college to pursue a career in entertainment. In later years he has become a generous contributor to various causes and institutions, particularly Atlanta's Spelman College, and is often seen at track-and-field meets for amateur athletes, to which he also contributes. In 2003 he was honoured with the Bob Hope Humanitarian Award. In 1965 he became the first African-American actor to star in a weekly television dramatic series, I Spy (1965�8), winning two Emmys as an undercover Central Intelligence Agency agent. 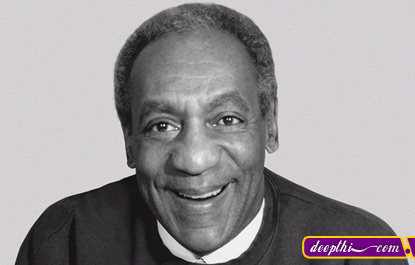 Later series were The Bill Cosby Show (1969�71), The New Bill Cosby Show (1972�3), and Fat Albert and the Cosby Kids (1972�84). His interest in children and education led him to earn MA and EdD degrees at the University of Massachusetts and to incorporate many of his ideas and ideals in his work. As obstetrician Cliff Huxtable in The Cosby Show (1984�1992), he projected a new image of middle-class African-American families, and the programme was one of the most popular and lucrative in television history. His gentle, wry clowning appealed to both children and adults, leading to a series of successful TV commercials, comedy records, and books, and making him one of the wealthiest people in the history of the American entertainment industry. Only his films failed to be money-makers.